Australia’s major supermarkets are facing fresh calls to remove unhealthy snacks and drinks from their checkout areas. It comes as a new study from researchers at the Global Obesity Centre, based at Deakin University, have assessed the nutritional policies of Coles, Woolworths, ALDI and IGA, finding they could be doing much more to encourage healthy food choices. The supermarkets were each given a rating out of 100 in the review which examined six key business areas, including their nutrition labelling, promotion practices and product accessibility. “Unhealthy diets and obesity are leading contributors to poor health in Australia. Tackling the issue requires a comprehensive societal response, including government policy and wide-scale action from the Australian food industry, which includes our supermarkets,” said lead author of the study, Professor Gary Sacks. Woolworths ranked highest in the review with a score of 46, followed by Coles (41), ALDI (11) and IGA (8). The data examined included publicly available information collected until the end of 2017, plus policy information provided by the retailers. The information was then assessed using the Business Impact Assessment – Obesity and Population Nutrition tool developed by INFORMAS, a global network of public health researches that monitors food environments worldwide. Professor Sacks said it was extremely difficult for a shopper to make it past the checkouts of a supermarket without being tempted by unhealthy options. “The supermarkets are quite vocal about being healthy places to shop, but the reality is once you are in store there is heaps of promotion of unhealthy food,” he said. In the UK, several supermarkets have recently committed to not stocking checkout areas with chocolates or soft drinks, and Professor Sacks is calling on Australian supermarkets to follow suit. The study also called on the supermarkets to have fewer price discounts on chocolates and chips, and instead make healthy, fresh produce more affordable. A recent Canstar Blue survey found that Australian shoppers love a bargain, with almost nine out of ten respondents (88%) admitting they pay close attention to special offers and promotions. In addition, 52% of shoppers said they tend to make impulse purchases at the supermarket. The survey also found that consumers don’t mind ‘shopping around’, with just 39% doing all of their grocery shopping with the same supermarket chain. 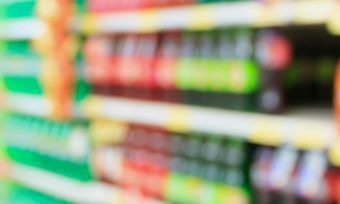 44% said they tend to buy supermarket labels rather than big name brands, while 28% have started using a different supermarket in the last year. Of those that have switched supermarkets, the majority (53%) cited price-savings as their main motivation for doing so. The second most common reason given was convenience (25%), followed by better quality products (21%).